Ufone doesn't stop amazing its users who are heavily dependent on SMS or text-obsessed consumers. The company has unveiled a host of cool packages with low rates yet the number of SMS you can make is as promising as before. Checkout the rates, codes to subscribe and validity period for each package. How to unsubscribe/deactivate Daily Package? This could be a huge blessing for easy-going slackers (lol) as they don't have to go to "write message" box and send another subscription text to the company every 24 hours to keep the package activated. Ufone is here to do it for you. Sit back and enjoy the service. If you want to continue to use the daily package without having to resubscribe by sending 'sub' to 605, be sure that you don't run out of your balance as it will get you deactivated from it. How to unsubscribe weekly SMS package? 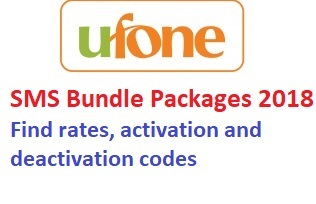 For more details, please log on to Ufone official site to get a better idea of how the packages work as you might have a lot of other questions regarding each package. How to subscribe to any package of your choice? Step 2) Send this message to your choice of above-mentioned codes (see the tables above to find the code of your choice). Please do not forget to give a thorough read to the terms and conditions section at the official Ufone site as there may be many technical points you are still unaware of. For instance, various taxes depending on where you live (province/Federal) are typically applied to all Ufone's services. Keep in mind that subscribing to a package will incur cost, which Ufone mentions as "standard rates to be applied." There are costs (albeit meagre) on each of the company's service. For instance switching to another SMS package will typically incur cost. To give you a rough idea of the charges and rates for an "SMS package change,". To deactivate a package and switch to another one , you will be charged a standard rate of Rs. 11.9 (inclusive of taxes). How to check remaining free SMS? To check remaining number of free SMSs, send a blank message/text to 606. You will also get to know about the expiry date of package. GST (General Sales Tax), being the most popular form of tax, is applied to each of the services, but there is another form of taxes levied - AIT (Advanced Income Tax). The rates for taxes may vary from province to province. Check this out .